Last week I wore a new sweater out to meet up with some of my girlfriends for dinner. What they didn't know was that this was the third time that week I was wearing the sweater. (It's seriously that comfortable!) As soon as one of them asked where it was from, they were shocked to hear "prAna!" I think there's a misconception out there that prAna sells "just yoga clothes." Yes, they do have an amazing line of clothing dedicated to all the yogis out there but they also carry so much more than that. From prAna, "When you reach into your closet, there should be something there that reflects who you are, how you feel, and what you value most. There should be something that you can put on in the morning and confidently wear all day long. Something you can throw in your bag and know will work for whatever your journey brings." I don't know about you, but that sounds pretty awesome to me. Before I had kids, my husband and I were pretty adventurous. We traveled frequently and spent many weekends hiking and rock climbing local trails. Adventure looks a bit different these days but while I wish I had known about prAna back then, I can appreciate that while my adventurous side has taken a bit of a back seat to raising children, I can still find sustainable, stylish pieces that complement where I'm at in this season of life. 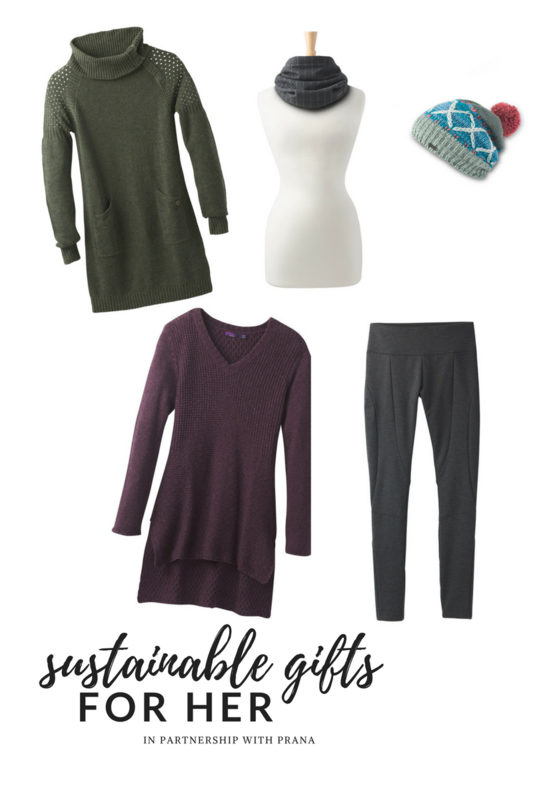 The folks at prAna were kind enough to send me two pieces from their Fall collection to try out and I'm pleased to report that I love them both! First up, this sweater is a must-have. It's the Deedra Sweater and I''m wearing it below in coal. I love it so much that I'm thinking of getting it in white as well. It's forgiving and cozy and versatile. It can be worn with yoga pants and UGGS (my favorite combo) or denim and flats. For a cozier, more tunic-like feel, I sized up and went with a medium. Speaking of denim, these are the Kara Jean in Stretch Denim. What I love most about these pants is the rise. It comes up high enough to keep you tucked in but not too high that it feels like you're wearing granny pants. These jeans are also so easy and comfortable to move in. I can wear them all day long, running errands, playing chauffeur and chasing after my kids which isn't like most of my jeans where by midday I'm contemplating ripping them off and setting them on fire. They are, however, unusually long and I recommend wearing them cuffed or getting them hemmed. I have a 33.5" inseam and these pants are long even for me! No matter your build, your hobbies or your enthusiasm for nature, there's something at prAna for everyone. Below are some of my favorite picks this season, items that would make great gifts for the women in your life! For 15% off of your order, now through December 20th, use code "CMLC17." I received these items for free in exchange for my honest option, as expressed above. No additional financial compensation was given.